Signode pneumatic tensioners take most of the effort out of strapping large or compressible packages. They also make tensioning uniform and precise through adjustment of the air pressure regulator. All pneumatic tensioners, except theWP-2, have unlimited strap take-up. All pneumatic tensioners are furnished with a quick-disconnect plug. It is essential that an air filter-regulator-lubricator assembly be installed ahead of the tool on the air line. Please contact us for pneumatic tool accessories. Signode pneumatic sealers let compressed air do most of the work. They are used to achieve high production on heavy strapping, especially when seals are in awkward positions or whenever productivity must be maximized. These labor-saving sealers come in two basic styles. Those featuring pistol grips are lightweight for easy one-hand operation. Diaphragm types are for heavier-duty applications, such as carloading. 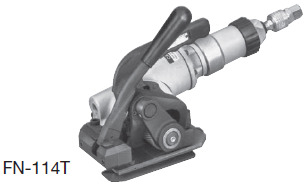 All pneumatic sealers are furnished with a quick-disconnect plug. An air filter and regulator are necessary. A lubricator in the air line is not required. Contact us for pneumatic tool accessories and to help you configure a new system. ** Three seals are required per joint.